One of the surprises from Capcom at PAX East will actually be an arcade port of two beloved beat em' up classics. 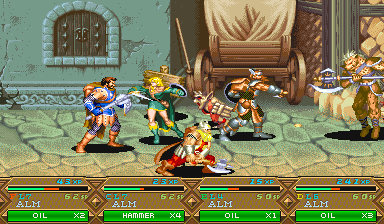 Capcom will be porting both Dungeons & Dragons: Shadow Over Mystara and Dungeons & Dragons: Tower of Doom to both the Playstation 3 and the Xbox 360 via the PSN and XBLA, respectively. These two Dungeons & Dragons titles are well known in beat em' up circles as being definitive representatives of the genre. The games have a lot less to do with the pen and paper mechanics of RPG's, and a lot more to do with fighting and action. We wrote about both Tower of Doom and Shadow Over Mystara long ago as co-op classics. These classic reviews serve as a great introduction to the games for the uninitiated, and make the news of the ports even more sweet. Both games are also fundamental to the highly anticipated Dragon's Crown. In fact, the lead for Vanillaware and the director of Dragons Crown, George Kamitani, worked on both of these Dungeons & Dragons titles. The XBLA and PSN renditions will mark the first time that the games have been widely available since Capcom released a port of them for the Sega Saturn. That release was named the Dungeons & Dragons Collection. Look for more info on these classics during PAX East.